@Tex wrote: Man they should have nominated the film for best picture or Adam for supporting actor, even if they wouldn't have won. I think from a ratings standpoint it would have been some great buzz. As is they have a hard enough time getting people to tune in for these award shows. I think nominating something as mainstream as a Star Wars film in one of the big categories would have been great. I would have knocked off The Post from the Best Film category. It's really riding on the fact the Meryl Streep and Tom Hanks are in the movie. And I would have put Adam up in the place of Richard Jenkins for The Shape of Water. I enjoyed that film thoroughly, but Adam does so much more in his role as Kylo. Again, I know it's a seniority thing, but the character of Kylo Ren/Ben has so much more meat and range. Maybe if Adam is lucky he'll get nominated for Episode IX? Personally, I have no doubt that Adam Driver will win an Oscar one day, even if it isn't for Star Wars. Was there ever any doubt lol? He's wonderful and I look forward to the day he's recognized for his work, but Kylo Ren will be a nice feather in his cap when looking back on his career. How many actors get to be immortalized as an iconic character? I thought Adam should have been nominated for Paterson, as did many. But, unfortunately, the movie was too small and didn't have the backing for a campaign. I'm not surprised with the nominees, but I really wanted to Adam to be nominated for Supporting Actor. Scifi/fantasy movies rarely is ever get nominated in acting categories. They usually win a lot in the production categories though. Not even the greatest movie (for me) LOTR got any acting wins- I think Ian McKellan was nominated once. Yet LOTR won the most oscars in other stuff. I'm not surprised about the nominations, Star Wars is usually considered in more technical categories. But at the same time I'm a little sad for Adam because he did a great job. Anyway I'm sure that he will win something in the future, he's too good! @rawpowah wrote: From what I remember Episode IX is set to premiere on December 20th 2019. That is way too late in the awards season, as most of the award shows will have already announced their nominations. TLJ premiered way too late (iirc after nominations for the Critics Choice and the Golden Globes were announced). It's very difficult and very rare to get nominated for an acting Oscar without having been nominated for any of the precursor awards, particularly the Golden Globes and the SAGs. Not even Hugh Jackman and Patrick Stewart got a nomination for Logan, and they've been playing those roles for some time and the movie premiered much earlier in the year than SW. "The Dark Knight", for which Heath Ledger won his posthumous Oscar, premiered in the summer. Another blockbuster, the LOTR trilogy, only managed one acting nomination for the first movie, in spite of all their accolades (and that was for Ian McKellen, a senior actor). On top of that, Disney would have to mount a campaign for Adam, which they haven't done at all (and I doubt will do for IX, since it's premiering so late). Disney seems to care more about the nominations in the technical categories than the acting ones. If anything, what SW will do for Adam is put him in a position where he will be offered interesting roles in other movies that have more of a shot at resonating with the Academy. In addition, is there any way that in the next film Daisy and Adam will not BOTH be considered co-leads in terms of billing? If Adam was billed as lead, he'd have even less of a chance than he does now as supporting (and that chance is already pretty close to zero, sadly). 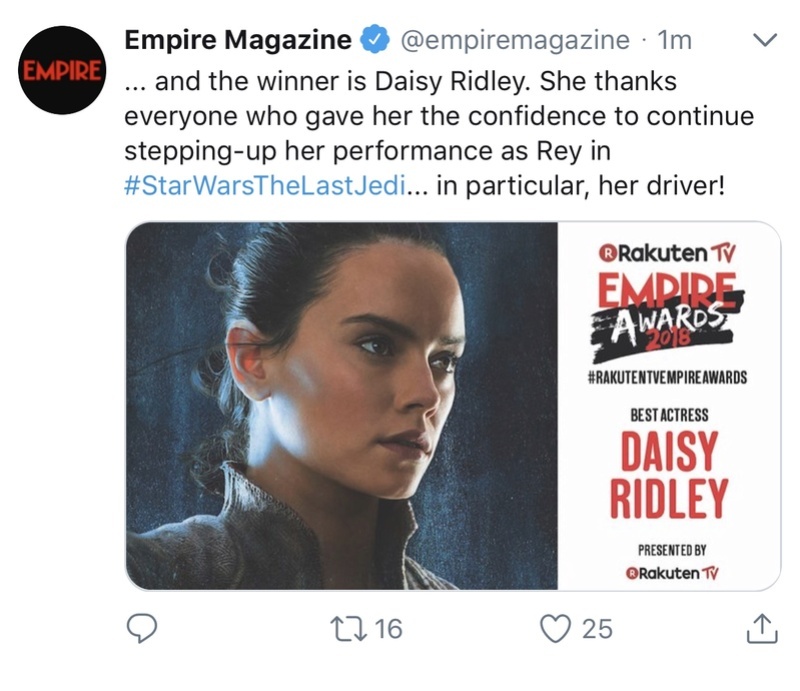 Or do we think Daisy will simply be the lead, and everyone else supporting (taking a cue from the Hunger Games series maybe)? Even if Daisy being the only lead was the original plan, Carrie Fisher's death may have put a bit of a wrench in that; the writers are certainly going to have to redistribute some of the focus as a result of her absence, and given Reylo's reception in this past film, I can't see how it's not going to be the main attraction. It could go both ways. We don't know what JJ will do with Luke in IX, so Disney might submit Mark for lead again. Or, like you said, they will pull a Hunger Games and only have one lead. It's also not unheard of for actors who fit the lead category to be put in supporting so they'll have a bigger chance to get nominated like Jake Gyllenhaal, Rooney Mara, and Alicia Vikander did. Tbh I'll take Adam getting more screentime than he did in TLJ over a minimal chance to get a nomination for a supporting role. He'll be amazing in the role no matter what. Now that the characters aren't as split up as they were in TLJ, and Snoke and Luke are no longer center stage, hopefully Kylo will get even more focus. Right. He might not have gotten the Academy nod which is frequently very political, but producers and directors all over the world have seen how brilliant he has been as Kylo Ren, a role that even the best (Eddie Redmayne) couldn't hit right. Adam's phone is going to be ringing off the hook. I actually think that they will have to submit Adam as Lead Actor in IX. Adam will get top billing, and frankly, Rey has never been as dominant as Katniss was in HG. There was never any question of Peeta Gale or President Snow being Katniss' equal. You cannot say the same about Kylo Ren. I mean Adam should have been in Lead Actor with Mark this year, so forget about IX. @cherrylipstick wrote: I'm not surprised about the nominations, Star Wars is usually considered in more technical categories. But at the same time I'm a little sad for Adam because he did a great job. exactly! He's been nominated for 3 Emmy's for his work on Girls, but has never won. He will become more and more noticed over time. He's building up quite a distinguished resume. I totally agree with you. 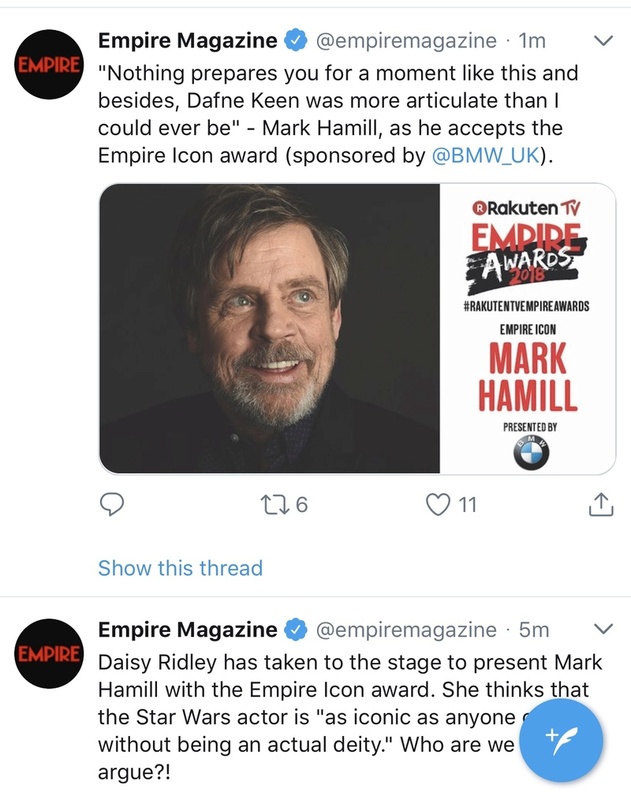 We'll have to see how much screentime Luke will have in IX and if Mark gets top billing in spite of the number of scenes he has. Billing also depends on whatever contract each actor has, so if Mark's contract says he has to get top billing, he's going to get it even if Adam's character is more important or has more screentime. I hope there's not much emphasis on Resistance shenanigans this time around and JJ focuses on the central story between Rey and Ren. Did someone famous write that tweet or is it just an example of exaggerated, but still amazing wisdom from a regular fan like us? Because seriously, Adam has had some incredible weight put on his shoulders over these last two movies and he exceeded every expectation both times when he had the most tricky character to play. I mean a slight pivot one way or another and the whole thing would have fallen apart. I definitely agree, Kylo Ren could have been a train wreck of a character (as opposed to an emotional train wreck, lol) in the hands of a less competent or less charismatic actor. This is why deep down I will always be Team JJ. He knew he needed Adam to be able to pull it off. Awards are the worst thing that can happen to anyone. You win the award you automatically become overrated. There are more actors with long careers who didn't win anything than actors who won. I remember reading the interview with Leo and he said the best advice we received about awards was when he was nominated for Gilbert Grape and was told not to try to win. cause he was so young and winning over a veteran would not be to his advantage. So he didn't campaign. Many times losing is actually winning in the long run and winning is losing. Cause wins means that you step on someone's toes. @vaderito wrote: Awards are the worst thing that can happen to anyone. You win the award you automatically become overrated. There are more actors with long careers who didn't win anything than actors who won. 'Award ceremonies' are outdated, fatuous things anyway. Ten years from now, no one's going to remember or care who won anything this year or last year or the year before that. I mean, someone like Adam Driver doesn't need to be given a little naked golden man for us to know he's a good actor. As someone (can't remember who) once said, these awards are just Hollywood's way of patting itself on the back for making 50 bajillion dollars yet another year in a row. The whole thing just irks me. It's not about film making. If it was, they'd let animated films be nominated for Best Picture. But no, can't have that, can they? Because animated films aren't real films. They get their little Best Animated Film award and are shuffled off to the corner so real film makers can continue to get high on themselves. My opinion on award/award shows has evolved in recent years. As a movie-goer, I do think they're still valuable at highlighting movies that I'd enjoy, but I've learned to put more focus on the nominee groups than on the actual winners. Outside of Moonlight last year, I can't think of a Best Picture winner that I've agreed with in recent years for the Oscars. However, learning about the pool of nominees has steered me towards some films that I've loved that I might have passed over otherwise. For example, I'll admit it--I thought I, Tonya was a bit of a joke until it started getting award buzz, so I ended up seeing it, and I friggin' loved it. And Allison Janney and Margot Robbie deserve all of the accolades that they're getting for their performances. I think that as with any sort of popularity contest (because that's what awards are), you can get something valuable out of it, but it's best to generally take them with a grain of salt. Agreed 100%. Trouble with Oscars is that they award what they find timely, and timely often isn't timeless so in 2 years or less, Best Picture is forgotten, has no relevance while something that maybe wasn't even nominated that year emerges as the timeless classic or at least a pop culture reference. Like, the movie of 2008 is TDK. It's still talked about, it's still considered the benchmark for its genre and blockbusters in general. Unlike the winner Slumdog Millionaire. What was the last Best Picture winner that people still remember, LOTR:ROTK? That was 15 years ago. I will admit that I, Tonya wasn't on my radar at all until the award buzz and now I definitely want to check it out. Ideally, I'd like to see an elimination of 'award ceremonies' and have them replaced with festivals akin to Cannes (I know Cannes gives awards, but let's be real no one really cares about them). Maybe instead of the Oscars we can have a week-long festival featuring screenings of the most noteworthy films of the past year, accompanied by panels discussing the films being shown as well as panels dedicated to the film making art in general (e.g., a costume designer panel; a set designer panel; a screenwriter panel; things like that alongside more obvious panels featuring directors and actors and producers, etc.). Ram and Rian being interviewed separately before the awards, they are right at the beginning of the clip. 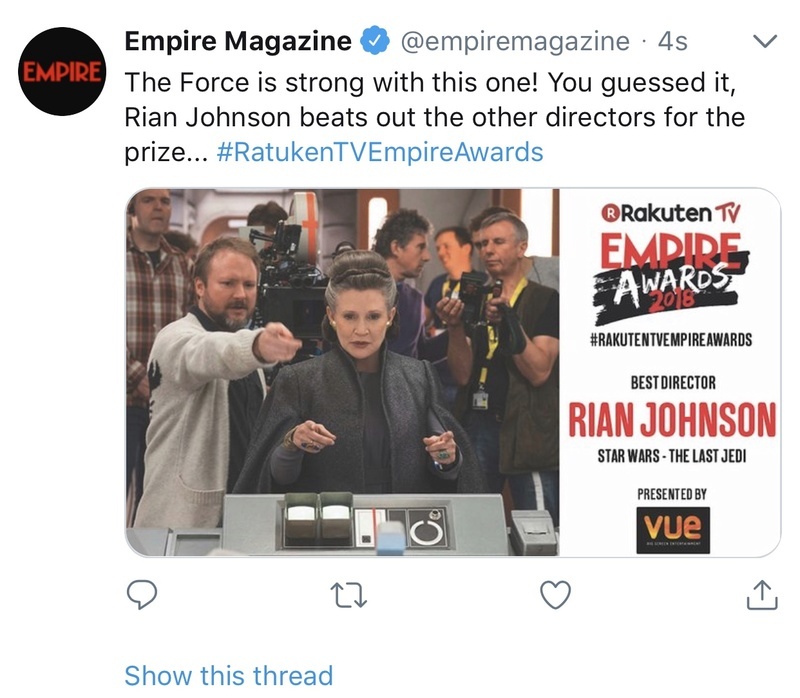 Interesting the Empire Awards are basically the last hurrah for them on TLJ. Edit - Oops wrong video, trying again!